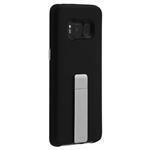 This protective, dual-layered case for Samsung Galaxy S8 offers a smooth soft touch finish and ultra slim design. An integrated metal alloy kickstand provides the perfect media viewing experience with both portrait and landscape viewing angles. Metallic chrome buttons accent and complete the polished look of your device.